Announcement *** All items ship out same or next business day! *** Offering installment payment plans for purchases over $100(USD). *** All items ship out same or next business day! *** Offering installment payment plans for purchases over $100(USD). Smaller than expected but perfect in every other way! L-O-V-E this shoppe! Gorgeous inventory that keeps you wanting MORE!! Seller is a joy to work with AND my newest acquisition arrived in SUCH an expedient manner!! Will MOST DEFINITELY purchase from this shoppe again AND again!! LOVE LOVE LOVE LOVE LOVE these earrings! I fell in love with them and am happy to report they are just as gorgeous in person! Quick shipping, great shop to work with (Jeanette goes above and beyond to to try work with you and accommodate your requests). I highly recommend this shop! I suspect I'll be a repeat customer.... Thank you, Jeanette! SO SO SO SO SO SO SO happy with my bracelet! Shipped very quickly, looks even better in person, and very happy that Jeanette was not only able to take out a few links so it fits me better, but she even included the links with my order. Maybe I'll make a matching necklace! GREAT shop, highly recommend! 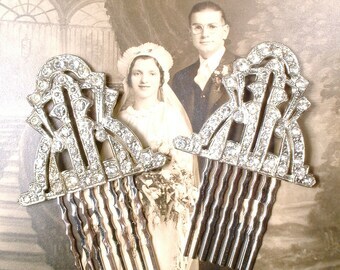 One of my antique Art Deco hair combs. Photo by Fotogramatica. 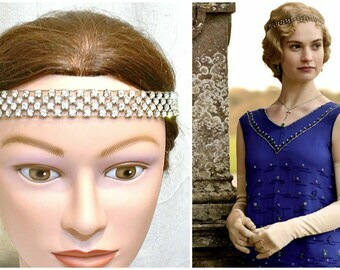 I provided The Countess of Rothes' jewelry and hairpiece for the 2018 Biltmore Estate's Titanic Movie Costume Exhibit. 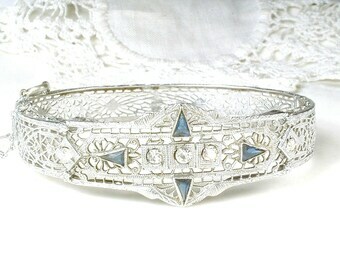 I was first on Etsy to offer One-of-a-Kind Vintage cluster earring bracelets! 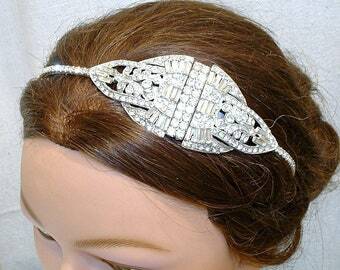 One of my Art Deco hair combs as seen in "Style Me Pretty". Photo by Onelove Photography. Welcome to my shop, "AmoreTreasure"! 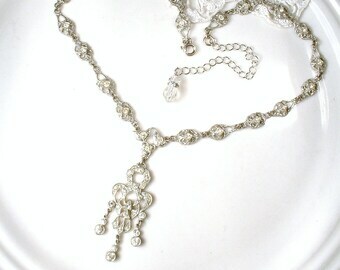 I offer couture bridal hair accessories and wedding jewelry made from antique / vintage jewels. 1920's Art Deco to 1960's specialty. My mostly One-of-a-Kind designs are meticulously and professionally redesigned from only the highest quality and most rare antique and vintage jewelry. Most of my pieces you will truly not find anywhere else. 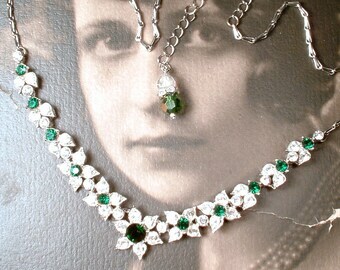 I also offer gorgeous unaltered period jewels. 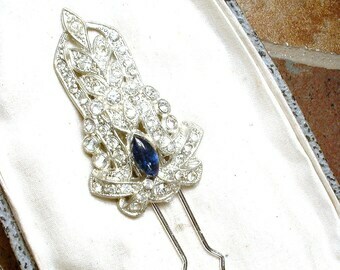 Eco chic vintage hair combs, sash brooches, bracelets, necklaces, earrings, headbands and hair pins perfect for a vintage wedding or formal event! 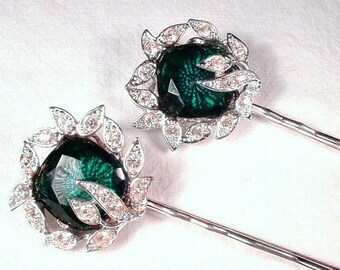 Now offering bridal purses and belts as well as cuff links, tie bars, and boutonnieres for the gentlemen too. I provide outstanding customer service, competitive prices, and combined shipping rates. All non-custom orders ship out within 1 to 2 business days! I love custom orders, so if you are looking for a particular color, style, size, or design, just ask as I have a huge vintage jewelry inventory to source from. 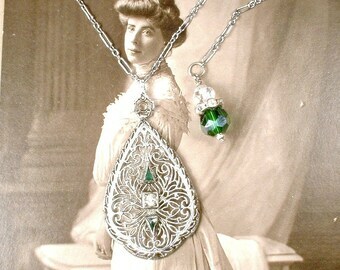 I love to design & create gorgeous couture, mostly one-of-a-kind, wedding jewelry re-purposed from beautiful high-end antique and vintage jewels from the 1920's - 60's. 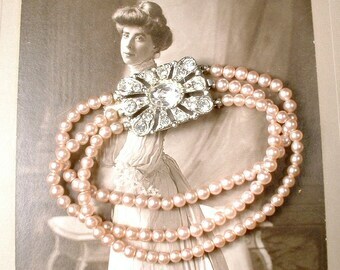 I also curate & offer unaltered period jewels. My shop is a one-person show. Please read all of my shop policies before purchasing. If you have any questions, feel free to contact me. I know how tough it is to purchase jewelry online (especially for an important occasion like a wedding) and I am so confident that you will be happy with your purchase that I, unlike most sellers, accept returns for any reason. I take returns on all items (other than most custom made/customized jewelry - see note below) if notified AND the item, in the condition it was received in, is put in the mail back to me postmarked to within 7 days of being delivered. (It is important to me to treat everyone the same so I am firm on the 7 day requirement; please do not ask me to make an exception.) Upon receiving the item shipped back at buyer's expense, I will issue a full refund of item purchase price excluding shipping and a 10% restocking fee or will also accept items returned in exchange for others from my shop for value of purchase price. Any discounts given as part of a sale requiring a minimum purchase will be forfeited when the original non-discounted total purchase amount less the non-discounted purchase price of the returned item(s) no longer meets the sale's minimum purchase requirement. "Free Shipping" means that I will cover the cost of delivery for a completed transaction, and that if a buyer wishes to make a return, their refund will be posted less the cost to ship the item out, and I will provide an image showing postage paid upon request. Returns are not accepted after 7 days from delivery date, and, after one week, I can not be liable for any further wear. *** Note: Though I don't automatically accept returns/exchanges on custom made/customized jewelry items (including brooches and buckles that were converted into hair combs per request of the customer), I will if I believe the colors used and the design will appeal to my customer base. Please check with me about the return policy before ordering custom made jewelry. I am happy to work with you to setup an installment payment plan for orders over $100.00(USD). I ask for a 20% non-refundable down payment to hold the piece and then require installment payments to be made at least monthly (some like to make payments weekly or bi-weekly so there is no problem with payments more frequent than monthly.) I can work with just about whatever dollar amount works well with your budget. The shipping fees are added to the last payment and once the final payment is made, your purchase will be shipped. Please contact me if you are interested in setting up an installment payment plan. Most items ship within 1 business day! * My standard shipping is USPS First Class mail though I do offer USPS Priority Mail (U.S. only) and USPS Priority Mail Express options for most items at check-out. * I will not cover items reported as not delivered if USPS tracking shows it has been delivered. * I do not require 'signature confirmation' unless buyer requests it. If you would like this service, please contact me for rates. * All delivery times provided are estimates from USPS based on shipping service selected and are not guaranteed. Please be aware that in the spirit of "Reuse/Repurpose/Upcycle", I reuse outer packaging material whenever I have it. It is good for the environment and keeps shipping costs down for both of us. However, if you prefer I use new packaging, please just let me know. US Postal Service provides tracking information only up until the package leaves the United States. After that point, additional tracking information may not be available. The postal system within your country may be able to provide tracking information once in your country if you give them the US Postal System tracking number for cross reference. * Customs fees, import duties, or import taxes, where applicable, are determined by each individual country and are the responsibility of the buyer. HOW CAN I FIND MY VINTAGE EARRING BRACELET SIZE? STEP 1: Measure your Wrist with a cloth tape measurements or a strip of paper just below the wrist bone, at the smallest part of your wrist, and measure it. Comfort fit add 1" - 1 1/4"
Looser fit add 1 1/4" - 1 1/2"
For example, my wrist is puny at 5 1/2". I like my bracelets on the looser side and wear this style bracelet at 7". It has room for movement but certainly is not falling off my wrist. HOW CAN I ESTIMATE VINTAGE EARRING BRACELET SIZE? My earring bracelets come a standard 7 inch length. I can get them down to 6.75 inches without removing a jeweled link or can lengthen them to whatever size is needed by adding heavier 1/4 inch silver or gold plated chain links between the end jewels and the clasp hardware. There is no extra charge for altering the length. DO YOU OFFER INSTALLMENT PAYMENT PLANS? I am happy to setup an installment payment plan for orders of at least $100(USD). Please contact me for details. HOW DO I CLEAN AND STORE VINTAGE JEWELRY? To clean vintage rhinestone jewelry, slightly dampen a soft cloth with window cleaner and gently wipe the surface of the jewelry to be cleaned. NEVER submerge vintage rhinestone jewelry in any kind of liquid as the liquid can get underneath the rhinestones and damage the foil backing. 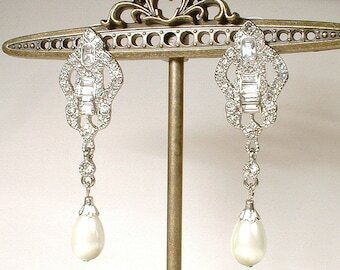 Do not submerge vintage simulated pearl jewelry in any kind of liquid as it can damage the coating on the faux pearls. It is important to always store your jewelry in a dry place. Also, be sure to put your jewelry on AFTER you apply hair spray and spray perfume. * International Customers - Please contact me for rates if you are interested in purchasing shipping insurance.